Jessica Lee and Tharanian Mahendran talk through the Microsoft Immigration Management System (MIMS) portal that they worked on together. Lee is an IT engineering program manager in Microsoft Core Services Engineering and Operations (CSEO) and a new hire at Microsoft. Mahendran, Lee’s mentor and manager on the project, is an engineering manager in CSEO. Often foreign workers struggle to keep up with the many legal steps they must take to keep their work visas up to date, creating a simmering worry that never seems to go away. 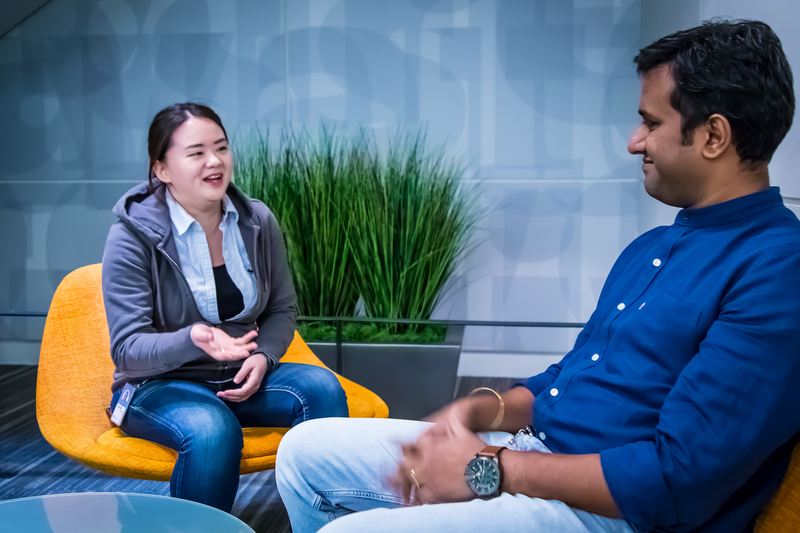 When Jessica Lee was offered the chance to ease that stress, the IT engineering program manager in Microsoft Core Services Engineering and Operations (CSEO) leapt at the chance. 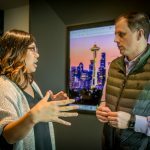 Lee was asked to help build the Microsoft Immigration Management System (MIMS), a Dynamics 365 portal that made it easier for the company’s 15,000 visa-dependent employees and their families to get help, to get their questions answered quickly, and to hear reassurances that they were going to be OK. It launched six months ago. Lee was someone with new ideas who had experienced immigration challenges as a dual citizen of the US and South Korea. The Corporate, External, and Legal Affairs (CELA) US Immigration team has moved its procedures and processes into the MIMS portal, creating efficiencies that have allowed team members to get back to helping visa-dependent employees remove the worrying about stressful, labor-intensive immigration processes so they can work their jobs and take care of their families. Lee’s work to help shape the MIMS portal was critical and much appreciated, says Bob Ulmer, a manager within CELA’s US Immigration team. The CELA US Immigration team uses the portal to communicate with foreign nationals and to help them stay in good standing to work in United States. A visa endorsement permit allows a non-US passport holder to enter, travel through, or reside in the country for a specified amount of time. The US Immigration team works with multiple internal and external partners to process employee cases, such as applying for H1-B, L-1, and many other work permits. Thanks to work by Lee and the CSEO team, the immigration team members are now able to use MIMS to see all the work in their queues at one time—they don’t have to search for the cases they’re currently working on. Specific tasks can be assigned to an individual, with due dates and priorities. It’s an efficient way to show what needs to be worked on, today, Ulmer says. Specific MIMS views—such as all approved cases or all active cases—can be configured and created, and then shared by administrators with an individual or a team. The immigration team was using a third-party Software as a Service (SaaS) immigration case management solution, but escalating performance issues made it clear that it couldn’t scale to meet the company’s growing needs. MIMS replaced that solution—the team now uses MIMS to manage its 60 unique case management workflows. Team members use it to create and populate documents as soon as cases are created, providing them with an intuitive at-a-glance, holistic view of case status, ownership, and current action items. They also use it to manage documents and reuse information. Lee became a pivotal part of building MIMS, but it didn’t start out that way—like any fresh university recruit, she had to start with the simple stuff and build from there. She is working in CSEO as part of Microsoft Academy for College Hires (MACH), an accelerated career development program designed to allow new hires to rotate through several positions at Microsoft before deciding on their permanent job. She started out as a scrum master, working on basic tasks as she tried to understand what the team was doing and figuring out how she could help. Her powerful curiosity, work ethic, and willingness to try, fail, and learn all paid off as she quickly moved on to owning features, to, within a few months, stepping up doing overall portal product owner role with help of mentorship from Mahendran. Lee’s ability to get feedback, incorporate it, and adjust is what makes her stand out, he says. For her part, it was just pursuing her passion—learning new things. Lee was struck by how challenging it was for visa-dependent employees to navigate the old, fragmented immigration experience—foreign nationals were required to upload the same documents into the system over and over, to stressfully watch for incremental deadlines that they couldn’t miss, and to find their way through a system of apps and processes that were confusing, difficult to use, and unconnected. From there, she made a recommendation on what to build into the portal—she suggested the team start from scratch instead of trying to retool the old one which will gain a brand-new experience for end users. “That was the kind outside thinking we needed to really start fresh, to build something that would truly work for our foreign national community,” Mahendran says. 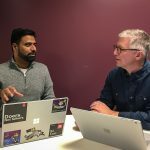 For Lee, Mahendran, and the entire CSEO team, getting it right for all Microsoft visa-dependent employees was well worth it. Read this blog post to learn more about how Microsoft responded to last year’s travel ban, and check out this case study to learn more about MIMS.